We love what Bloomingdale’s is doing in anticipation of Super Bowl XL VIII. 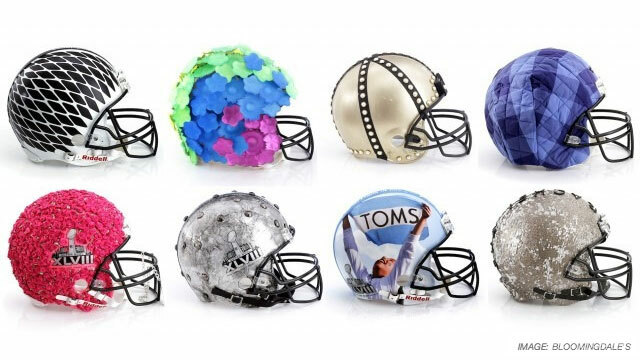 Instead of funneling their energy into high-impact advertisements or high-calorie game day snacks, they’ve teamed up with the Council of Fashion Designers of America (CFDA) to create some impressively unique—and visually stunning—auction items: 48 haute–couture football helmets. These life-saving, ultra-protective and beautifully clad-out helmets remind us of what the Speck design room looks like on any given day. Our Colors, Materials, and Finishes team experiments with ways to make our cases look and feel, while our engineers ensure these cases stand up to the ultimate protection tests—many of which meet or exceed military-grade drop test standards. Another reason this campaign hits close to (Speck’s) home: Our award-winning CandyShell’s dual-layer construction uses the same TPU that you can find lining these football helmets. Think your phone can endure the extreme wear & tear your favorite NFL teams do in a given game? If you’re covered by Speck, it certainly can. So for protection that lasts, with a look you can’t beat, bid on one of these helmets to improve the health & safety of youth sports. Otherwise, check out our line of military-grade protective cases and see how you can look fabulously smart by covering your device in the most durable defense you can get. Check out Mashable’s full article here.